Are you starting out the new year sober curious? This week on More Good Day Oregon, I made a tasty and booze/guilt-free beverage called the Spiced Mule Mocktail. Check out the video below as I make this festive mocktail step-by-step. Sober curious is a term — an energy, a dynamic, a trend — I’ve been exploring for the last several years. My impulse to drink less started with a desire to lose some mid-age belly bloat, and the more I explored the issue, the more I felt compelled to cut back on my drinking. Not 100%. Not yet, and maybe never. But I wanted to see who I could become without alcohol weighing me down, physically and energetically. The role of alcohol comes up often in my work with clients as well. I can’t even tell you how many times I’ve had clients tell me, “If I could only give up wine…” But when you actually start exploring what that would take, it turns out they’re unwilling to change. It’s too hard, they say. I love it my wine too much! Maybe this sounds like you? If so, I totally get it. No judgment here. After all, it’s not like I’ve completely lost my taste for martinis and wine. However, I’ll also share that over the last couple of years, I’ve been following through on my intention to drink less, and the positive impact has been profound. Overall, I don’t typically drink during the week, and I try to limit weekend consumption to 2-4 drinks. Some weekends, I don’t drink at all. Here’s the thing — as we get older, it becomes harder and harder to metabolize alcohol. We all know that intuitively, right? We get hangovers more easily, and we can even feel foggy the morning after we’ve had only one or two drinks. Plus, there are the other, more compelling reasons to cut back on alcohol. Number one: drinking alcohol increases women’s risk for breast cancer. It can also contribute to depression and anxiety. So, if you use alcohol to manage stress, you should know that alcohol can actually make anxiety worse! These are the aspects around alcohol consumption that somehow escape mention in advertising, Facebook memes about moms and wine, and popular culture around happy hour and Skinnygirl-margarita-fueled girls nights out. Ironically, alcohol use among women has grown exponentially over the past couple of decades, in spite of the health risks. 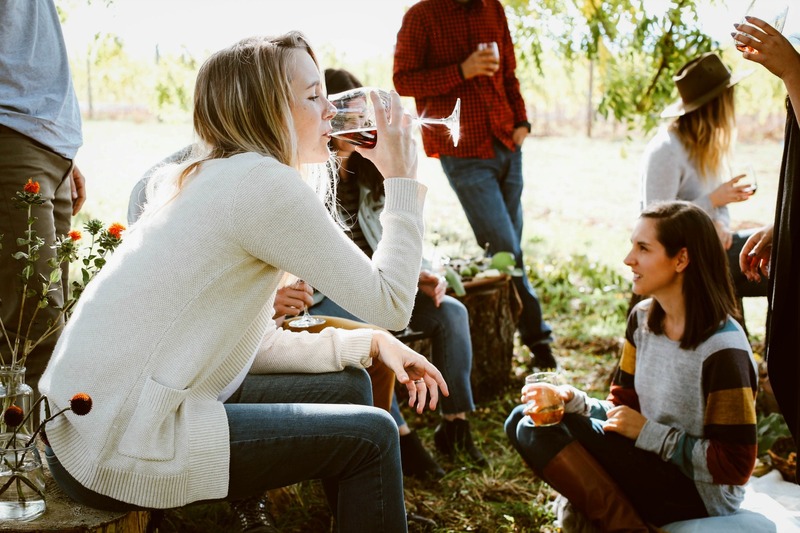 For an eye opening look at this topic, especially mommy-centric wine and spirits culture, check out Johnston’s article on Huffpost. Bottom line: I’m not saying you need to give up alcohol to be healthy. However, if you’re a woman, you should definitely understand how the current marketing environment and popular culture may be affecting your alcohol habit. And if you’ve ever questioned alcohol’s role in your life — and you wonder what positive outcomes might happen if you cut back— I encourage you to get sober curious. Especially if you have a goal of losing weight, reducing cancer risk, or resolving other issues in the body. The Mayo Clinic says that moderate consumption for women is defined as up to 1 drink per day; in other words, no more than 7 drinks a week. 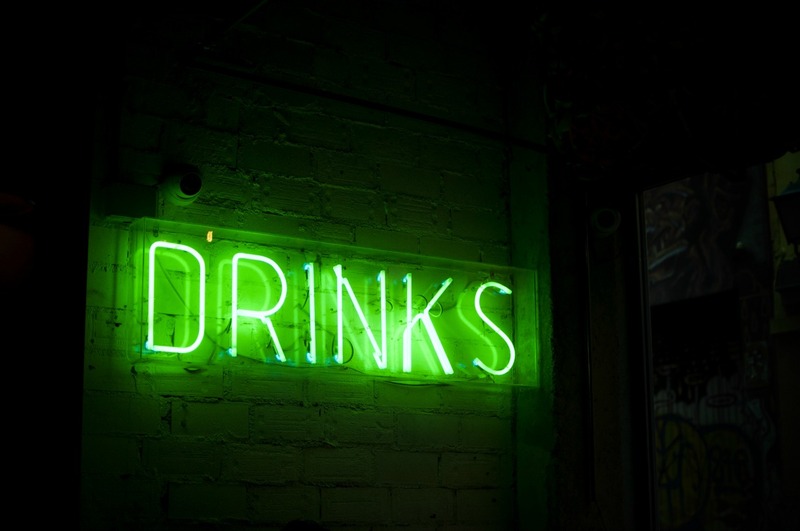 Heavy drinking is more than 3 drinks on any day or more than 7 drinks a week for women and for men older than age 65. By one drink, doctors mean one 5-ounce pour of wine or a mixed drink with one ounce of liquor, which is a lot less than a full glass of wine, which might be 8 ounces or more. Most everyday drinkers are exceeding this definition for moderate consumption, especially during the holidays or summertime (a.k.a. rosé-all-day season). We simply can’t change what we’re not aware of. So I encourage you to pay special attention to how much (and why) you’re actually drinking. Ask yourself the tough questions such as: why am I drinking right now? Am I drinking to change my mood or deal with stress? If so, is there something more helpful (and healthy) I can try instead? How will I feel about having this drink an hour from now… or tomorrow? Does alcohol truly help me connect with people in a meaningful way? Or does it just provide a superficial connection that wouldn’t be possible without alcohol? For a truly empowering experience, try journaling about your relationship with alcohol, using these questions as writing prompts. You may even find — as many people do — that it’s simply easier to abstain altogether, instead of bargaining with yourself about how many drinks you can (or shouldn’t) have on any given night. When you go to a party, try bringing a huge growler of kombucha or your favorite sparkling water. Chances are, you’ll find someone else who’s trying to drink less — someone who will be more than happy to share a kombucha toast with you. Plus, if you have a drink in your hand — albeit non-alcoholic — most people won’t even notice you’re not drinking. Another favorite mocktail of mine is club soda and a dash of bitters — it’s super refreshing and even looks like a legit cocktail when it’s in a rocks glass, over ice. If in Portland, try bitters from The Bitter Housewife. So good! Be brave — your body will thank you for it! I know the idea of life without alcohol (or less) can sound scary. But it’s something worth being curious about, especially if you want to unlock deeper layers of wellness in your body, mind, and spirit. 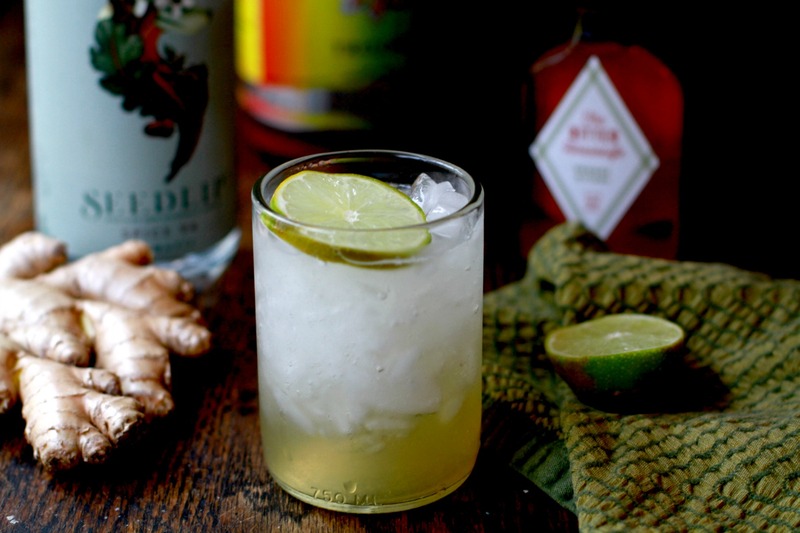 This Spiced Mule Mocktail recipe was inspired by a great booze-free product I’m loving: Seedlip, a non-alcoholic distilled “spirit” made from botanical spices and citrus peels. 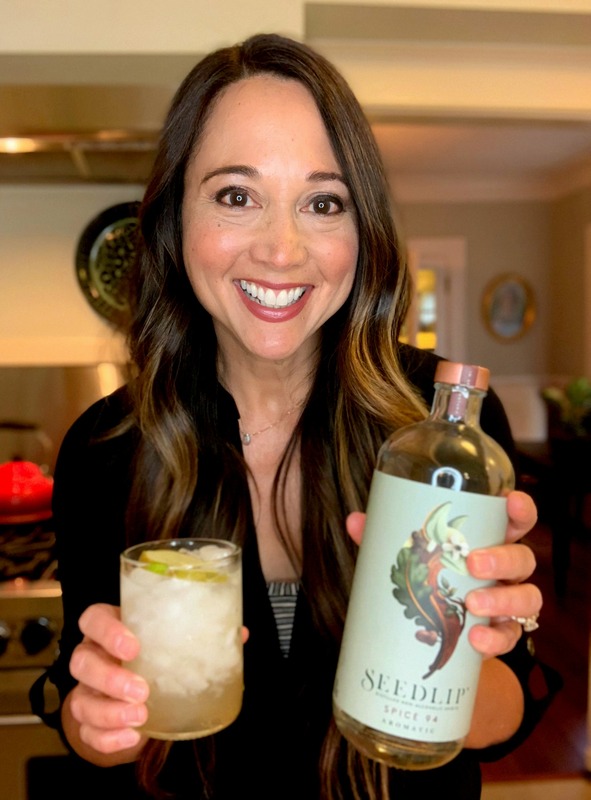 Seedlip is made using a meticulous copper pot distillation method from the 1600s, and it tastes delicious in mixed drinks of the mocktail variety. Seedlip is sugar-free, sweetener-free and contains zero calories — and it’s completely non-intoxicating and booze-free. I like the Spice 94 flavor, because it’s perfect for a non-alcoholic version of the Moscow Mule. Seedlip is based in the UK, so it has limited retail distribution here in the US. However, you can order online here. TIP: The Gingered Honey mixture in this recipe is also great added to plain sparkling water or hot tea. To check out the recipe, just click on the green box below. I hope the recipe and resources above help with your own sober curious journey. If you make this Spiced Mule Mocktail, tag me on Instagram — I’d love to hear from you! Getting to a healthier default setting isn’t always easy. But it becomes much easier with some extra support. 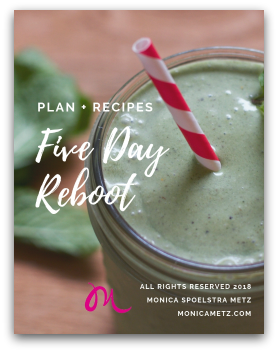 That’s why I created this great freebie: The 5-Day Reboot Plan + Recipes. This handy PDF contains all you need for a quick kickstart: general nutrition recommendations, a meal planning template, and 18 delicious recipes — all in one handy document you can download. Just click here to get your free PDF.